The art of the Magician of Stones is to use his savoir-faire to enhance the pieces by adding a magical radiance to the diamonds : the head of the snake represented by the drop motif and crowned by gold beads is highlighted and magnified. 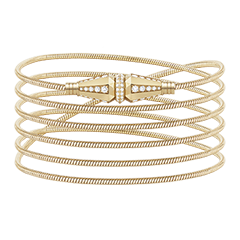 Serpent Bohème Sleepers L Motif Sleepers set with pavé diamonds, in yellow gold. 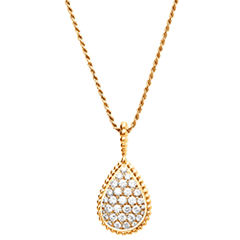 The drop motif is set with diamonds and bordered by gold beads. 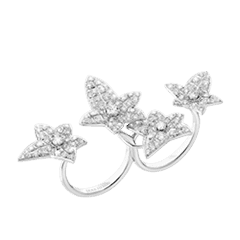 The refined honeycomb offers a sparkling effect and enhances the radiance of the diamonds. The art of the Magician of Stones is to use his savoir-faire to enhance the pieces by adding a magical radiance to the diamonds: the head of the snake represented by the drop motif and crowned by gold beads is highlighted and magnified. There’s a certain mystery in Serpent Bohème. A spellbinding aesthetic that entices women of character and arouses their femininity. Produced by Boucheron’s workshop for the first time in 1968, the Serpent Bohème collection has been reinvented with colorful gems. 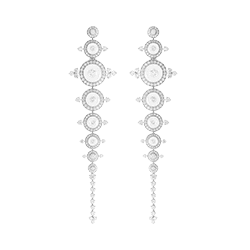 These earrings, set with white mother-of-pearl and crowned with gold beads, complete the collection’s pavé diamond creations. There’s a certain mystery in Serpent Bohème. A spellbinding aesthetic that entices women of character and arouses their femininity. Produced by Boucheron’s workshop for the first time in 1968, the Serpent Bohème collection has been reinvented with colorful gems. 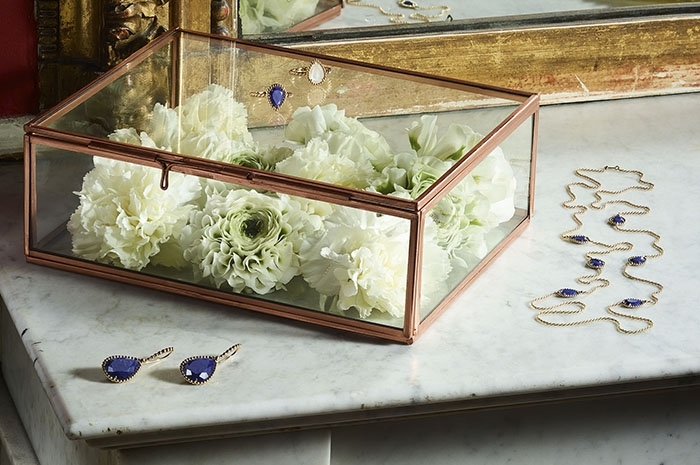 These lapis lazuli sleepers crowned with gold beads complete the collection’s pavé diamond creations. With their oversize 'goutte' [drop motif] guaranteeing a big look, these Serpent Bohème earrings in diamond-paved yellow gold reveal all the luxuriance of the Serpent Bohème collection created in 1968. All the sensuality of the Serpent Bohème collection is expressed in these diamond-paved yellow gold sleepers earrings. 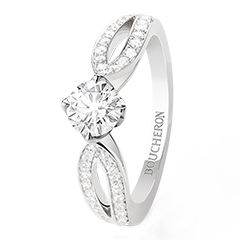 They subtly evoke the Maison Boucheron's subversive and daring spirit. These Serpent Bohème pendant earrings in yellow gold set with diamonds have four diamond-paved drops. 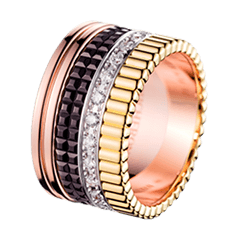 Timeless pieces with overtones of the seventies, they express the creativity and daring of the Maison Boucheron. 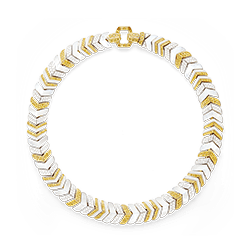 One of Boucheron's great classics, the Serpent has reigned proud in the Maison's collections since 1870. Set with a white mother-of-pearl drop crowned with yellow gold beads, these Serpent Bohème studs gracefully adorn the ear. As wild as it is mesmerizing, the snake was destined to seduce. The contrasts between the mother-of-pearl and the diamonds set in different sized motifs make this variation of the Serpent Bohème collection quite unique. This Serpent Bohème creation disregards convention. With the confident contrast between the deep blue lapis lazuli, the sparkling diamonds and the asymmetrical motifs, these pendant earrings create a sensual and edgy look. Crowned with gold beads, these Serpent Bohème stud earrings combine the sensual allure and subversive spirit of this collection. They emanate the desire and captivating charm of citrine. 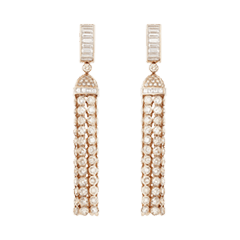 These pendant earrings, paved with diamonds and now set with citrines crowned with gold beads, are delicate and feminine. The light shines through them, giving the stones added sparkle. 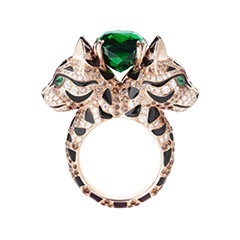 This design, unique to Serpent Bohème, is testament to the incredible art of the jeweler. There is something hypnotic about the Serpent Bohème rhodolite garnet stud earrings. Their charming design appeals to spirited women, and to their femininity. The pendant earrings set with rhodolite garnets are a modern interpretation of the Serpent Bohème collection. The repeating drop motif subtly and figuratively symbolizes the snake's head. The Serpent Bohème malachite stud earrings figuratively reproduce the snake's head in the form of a drop. This sensual and timeless motif will appeal to adventurous free women. 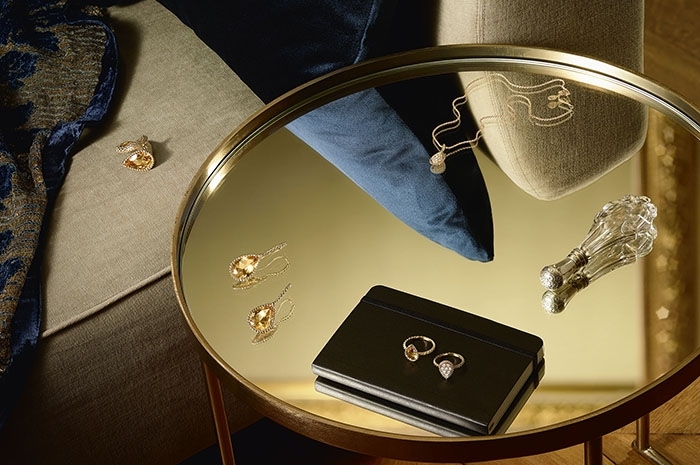 Famous throughout the world for its free and edgy style, the Serpent Bohème collection continues to be reinterpreted in the Boucheron workshops. The yellow gold pendant earrings set with malachite and paved diamonds have a charming, sensual design that appeals to independent women. The Serpent Bohème stud earrings reveal all the vitality of this iconic collection first produced by the Boucheron workshops in 1868. The turquoises adorning the drop motif with a contrasting blue are strikingly charming. These Serpent Bohème pendant earrings are vintage but definitely contemporary too. The sparkle of the diamonds complements the azure blue of the cabochon cut turquoises. This creation with its sensual curves shimmers with vitality as it moves. The Serpent Bohème XS Motif ear studs belong to one of the most iconic collections of the Maison Boucheron – this season available in pink gold.